We want you to be more comfortable and relaxed than you thought possible while you are here, to take care of any dental problems you have fast, effectively, and beautifully, and to send you home with the habits, tools, and techniques that give you the best possible chance of keeping your healthy natural teeth for a lifetime. If you've been to other offices recently you may have noticed the trend towards open-bay operatories. Those are convenient for the staff and require less space, but it is hard to feel relaxed when someone else is being treated 6 feet away. So, we use full rooms, with space for your stuff and a chair for your friend or loved one to be with you if you like. These are real rooms, with doors that close if you prefer complete privacy. We have blankets, noise canceling headsets you can plug your music player into, and, for those mature enough to use them, teddy bears. Most of our space is lit by natural light. The office is homey, not glitzy. Clean, comfortable, and just a little bit quirky is our vibe. On the walls, you'll see pictures of beautiful things, not diseased teeth. We respect your time. We allow plenty of time for each appointment and avoid overlapping appointments (double booking). If you do end up spending some time in the Living Room, you can relax and put your feet up in big comfy chairs, or plop your laptop on our table and catch up on a few emails. Either way, our guest WiFi will give you access to all the cat videos you secretly love. But let's say you're waiting with a kid or two, or just don't feel like being indoors. Right in our back yard is McKenzie Park, with swings, climbing structures, shade trees, tables & benches. We're happy to call your cell when it's time to come back. The first step is always getting a good look, especially where we can't see. 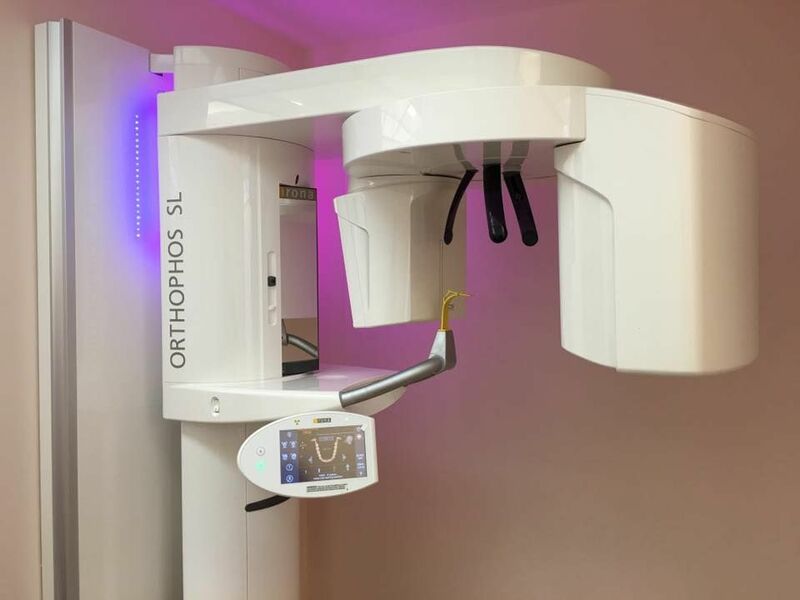 Our Orthophos SL lets us do check up x-rays from outside; no scratchy film or bulky sensor wedged in your mouth. Even better, just one image covers a much larger area than standard check up x-rays, allowing Dr. Amy to see what's going on down at the roots of your teeth as well as where you bite. Sometimes a person's teeth are positioned so that the SL can't give us a view between them, or we may need high detail in a specific small area. For those cases, we use an intra-oral sensor. With panoramic x-rays (often called Panorex), we will see your jaws, joints, teeth and all of the supporting bone. We also can see some of your nose, sinuses, and other small bones and ligaments between your head and your neck. All this allows us to find dental problems at an early stage. That can save money, time, pain and aggravation. We might find extra teeth, infections, cysts, salivary gland stones, or even carotid artery calcifications that can lead to strokes. Prompt attention to these matters may save your life! This system drastically changes the way cavities and cracked teeth are repaired. Dr. Amy only has to remove the damaged tooth structure to prepare the tooth where in the past, much healthy, undamaged tooth had to be removed. Then a 3-dimentional image of the prepared tooth is brought into a computer where Dr. Amy uses sophisticated software to design the perfect replacement for the damaged area. In 12 minutes or less, the design is milled out of a block of ceramic material designed to be a superb substitute for a natural tooth. Finally, Dr. Amy bonds the new piece into place and polishes it. The result is difficult to tell apart from your natural teeth. Plus, it is more compatible with your natural teeth than other materials. And it requires only one visit to complete, even if an entire crown is required. Read more about CEREC on our CEREC page. In many cases, Amy is able to use a hard tissue laser instead of a mechanical drill. There are various technical reasons this is good, but the one most immediately apparent to a patient is that fillings can often be completed with no anesthetic. No shot, no feeling numb for hours, no tingly sensation as the nerves wake up. That can sure make for a nicer day! One of the great challenges of effective, long term oral health is making sure that the teeth fit together and function properly, especially after fillings and other repairs. We call this getting the bite right. Dr. Amy is able to take a lot of the guesswork out of the process of getting the bite right by using TScan. TScan allows us to measure the biting force in real time at many points at once. Dr. Amy is able to use this information to detail the biting surfaces for good long-term chewing health. TScan also plays an important role in finding and fixing problems like jaw joint pain, headaches, and night-time teeth clenching. For a dentist committed to removing as little natural tooth as possible, the challenge is knowing when a problem has crossed the line from "keep an eye on this" to "fix this". Years of experience and training are most important, but technology is getting more helpful. Altered tooth structure and caries-causing bacteria fluoresce when exposed to certain wavelengths of light. DiagnoDent uses this to detect microscopic areas of decay in certain areas on a tooth, allowing Dr. Amy to stop a new, growing cavity before it does significant harm. The foundation of healthy teeth is healthy gums. We have a big bag of tools we use to get at gum problems, but one of the most promising is the soft tissue laser. We can use it sterilize gum pockets to remove harmful bacteria and promote healing. It can also be used to remove microscopic layers of diseased gum to allow the healthy layers underneath to flourish. Depending on individual circumstances, we may use Arestin, a highly localized, time-released antibiotic, or EvoraPro which promotes the growth of beneficial bacteria to force out the harmful ones. We always use magnification to see the finest details inside your mouth. We are also constantly reviewing and evaluating tools and materials to use the best materials for fillings, bonding, sealants, sterilization, polishing, homecare, etc. All the dental materials we use are BPA free. You may notice one piece of common technology not on display. We have decided not to have TVs. We try really hard to not give you enough time to watch a show! One thing we hear a lot is, "Nobody ever explained that to me before." Even better, we also get, "You really listen to me." Those comments really make our day because they say more clearly than anything else that we are accomplishing our goal of being your oral health partner. Instead of, "You need...", we prefer, "This is the problem, and these are your options." If you have a question, it is easy to get hold of Dr. Amy with email or a phone call. Also, we make sure there is plenty of time to talk about your questions or concerns during your cleaning appointments. But talking to you is only part of the story. If you need specialized services, you will appreciate that Dr. Amy has developed relationships with a wide selection of specialists and will find one that will work best for your needs and personality. And she has trained the specialists to know that she will be staying in close touch with them to make sure everything is done the way it should be and to coordinate any follow-up care. Being an advocate for her patients is a very important part of dentistry for Amy. All of our hygienists also excel at working with you to find the best way for you to take care of your teeth. We understand that one routine and one set of tools is not going to work for everybody, so we have an array of tools, tricks, and methods for you, so even if you've never had a good flossing habit, we can probably find a way that works for you to get healthier gums. And whether it be telephone or email (or, soon, text), you'll find it easy going to make appointments, get reminders, and otherwise, deal with the administrative side of things.